Spring’s here, a time for new beginnings. 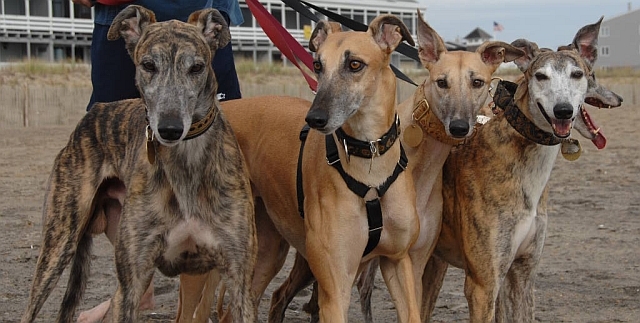 Consider giving a greyhound a new beginning. Here’s why. 9. If you think a lot of interesting folks stop you to chat when you’re walking one greyhound, wait until you have two on lead. 7. You will save on heating costs during winter since two- or three-dog nights are much warmer than one-dog nights. 6. You’re already experienced at dog training, so the second one’s easy. What’s more, the senior dog invariably shows the new one the ropes. 5. The season is right: there’s nothing like warm, pleasant weather to support you in a new project, like training a dog. 4. Dogs are social and enjoy one another’s company. Single dogs are lonely dogs, no matter how spoiled they act in the company of other canines. After an initial “let’s-get-rid-of-the-new-guy” period, they are always glad to have a permanent buddy, especially during those hours when you’re away from the house. 3. You will learn volumes about animal behavior as they interact with one another in fairly intricate ways. Living with multiple dogs will teach you the subtle complexities of their personalities. 2. You will double the affection, tail-wagging greetings, and laughs they provide. If there is more than one of you in your household, at least two can have shadows while working on various at-home projects. 1. You’re saving a life, rescuing the animal from the prison of the kennel. That makes everyone feel good, not only the dog. So think about it. There are lots of cuties up at kennels waiting for their very own humans. Won’t you consider saving another life?